(Telangana TIN No Starts With "36"
> Select e-returns Tab, then click on "VAT Return"
> If you have made No Purchases and No Sales, select the box. then select the Accept button then click on "submit Return"
> If you have any Input tax credit from the previous moth, you can see that amount here. > Enter "Exempt or non-creditable Purchases" Eg: Against 'H' Form Purchases etc. > Enter 4%, 5%, 14.5%, 1% Purchases and Special Rate Purchases. > Enter Exempt Sales total value. Eg: Against 'H' Form Sales etc. > Enter total International direct export sales Value. > Enter 4%, 5%, 14.5%, 1% and special rate purchases Value. Note: ITC Claimed value and Total Input Tax value will come automatically. Sl.No: 5: If you have pay any tax, that amount will be display here automatically. Sl.No: 6: If you want Refund the amount, you can enter the amount enter. (not recommended) - This option is enable, if you have any Input Tax credit. 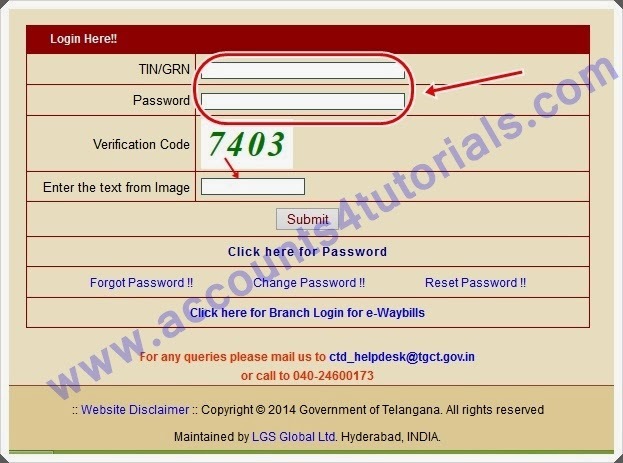 Sl.No: 7: Here you can credit carried forward amount. Sl.No: 7a: If you want adjust Input tax credit to the CST Returns, enter the value here. This option is enable, if you have any available Input Tax credit. Sl.No: 7b: Here you can see the Net credit forward amount to the next month. > Select "Accept" button, then click on "submit". Enter only total excluding VAT amount of particular month.The VAT amount will come automatically. You must show the total SALES for the particular month.But you can claim PURCHASES from last 6 months bills. You have only few minutes to submit the returns. The section is expired very short. So first prepare paper work then only submit e-returns. If you have any Input Tax credit, first adjust the amount in CST Returns, remaining amount forward to the next month. Submit returns before 20th. and pay the tax before 20th.